On Tuesday, Dec. 15, the Land and Community Heritage Improvement Program (LCHIP) held a media event in the NH Legislative Offices building to announce the award recipients of their 2015 grant round. Windham Presbyterian Church was among those recipients and was awarded a grant of $20,350 for the repair of the church steeple. 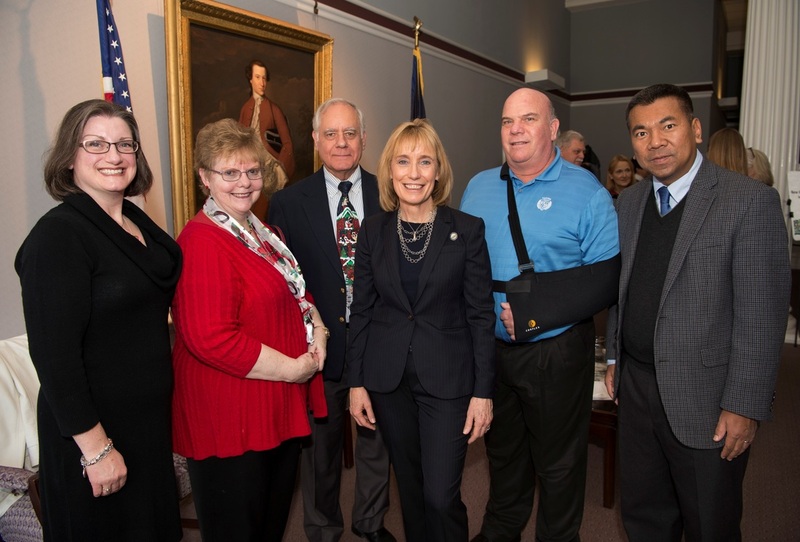 A group of five people from WPC, including Pastor Joseph, attended the event that included pictures with Governor Maggie Hassan and LCHIP Board of Directors Chair Doug Cole. A luncheon was held at the building housing the NH Preservation Alliance to allow all grant recipients a chance to mingle and hear remarks from members of other preservation agencies about the importance of maintaining our New Hampshire heritage through preservation of historic resources. 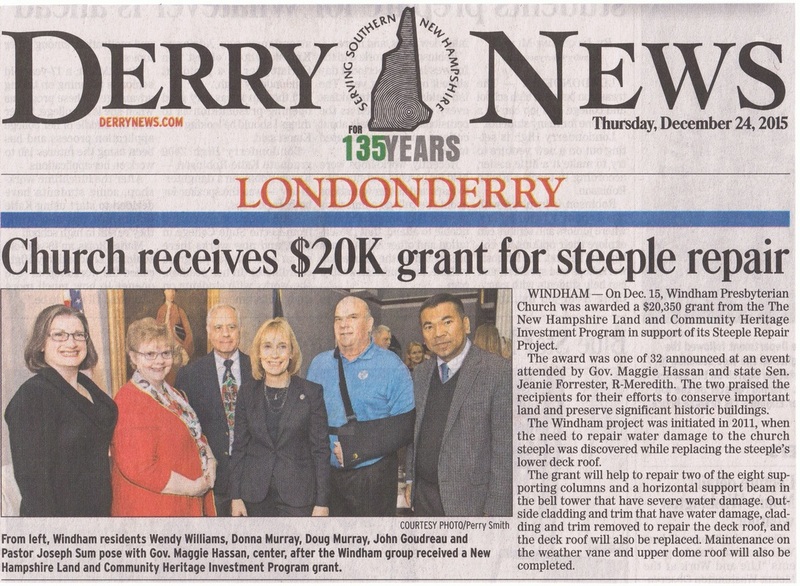 This grant, along with over $18,000 from our fundraising efforts, will ensure that the steeple repair project will be completed with minimal impact to the Capital Improvement Fund and our annual budget. Many thanks are given to GOD and LCHIP for this wonderful award. In March 2015 it was discovered that the belfry of Windham Presbyterian Church is home to a Holbrook bell. The following is forged around the upper circumference of the bell, “By G H Holbrook East Medway Mass 1847.” Holbrook bells were highly regarded for their undoubted superiority, pure musical tone, and extraordinary vibrations.1 Colonel George Handel Holbrook was a musician and improved the bell tones. The Windham bell rings the tone of A. The Chepachet Baptist Church, RI, maintains A National List of Holbrook Bells4 within which the Windham bell is not yet listed. They have been notified of the Windham bell discovery for future inclusion in the list.